These systems typically consist of a camera to capture the picture, a means of processing a number of cameras, a means of recording and a means of displaying the picture. 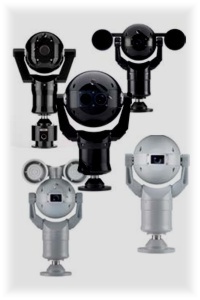 Cameras may be housed in purpose designed housings which are built to an IP rating, typically IP 65. For external use they include a demister for minimizing the window of the housing from misting with changing environmental conditions. Different cameras are designed to operate at different levels of lighting. Because colour production is less capable of operating at lower levels of lighting, many cameras incorporate a facility such that when the lighting level falls below a certain lighting level, the camera switches from colour capture to black and white, known a monochrome. When the lighting level increases the capture reverts to colour. Lighting can be assisted by using additional lighting, white light is required or infr-red from purpose designed lighting. A purpose designed source of lighting which is often recognized as a red glow. The red glow may not be acceptable, say in domestic areas, in which case different frequencies of light source can be chosen so that the red glow is invisible. The size will be influenced by consideration of the aesthetics, whether the camera is to be used as a deterrent and therefore needs to be obvious or whether it is to be inconspicuous. Cameras may be mounted in the shape of a dome whereby it is difficult for someone to see the area the camera is viewing. Alternatively the camera can be traditional in shape without a housing if it is internal or mounted in a box shape housing for external use. There are occasions when a crime is suspected and evidence is to be gathered for a persons or persons to be charged. The detail is referred to as the resolution of the camera and more recent cameras with high resolution are known as mega-pixel cameras. Cameras may be moved to view differing views and the control can either be by an operator using a CCTV keyboard or the system programmed to move and automatically view a number of specific scenes which is known as tours. Dependent on the environment the housing of cameras are designed to resist different levels of attack. The first need is to decide on the requirements of the particular camera to which the lens is to be fitted. View - lens can be chosen for wide views or zoom views for close up views of objects some distance from the camera. Motorised Lenses - these can be zoomed in or out and then refocused remotely. These are used where the camera direction can be changed. Auto-iris - The iris like the human eye determines the amount of light entering the camera. The function is an automatic adjustment within the lens controlled by the camera. If more than one camera is incorporated in the system it will need to be processed to be seen on a CCTV monitor. Such systems include switchers which switch from one camera to another to display on the monitor one camera at a time with a dwell time depending on the amount of time that is required to view each camera. Alternatively Quad units are available which display four cameras on the monitor at a time. Most common is the use of DVR's which is a unit combining electronic recording with a multiplexing facility. With such systems the recording and display can be arranged so that a number of cameras are recorded and displayed at the same time. More sophisticated systems receive a number of cameras and display them on a number of monitors in a chosen combination with a piece of equipment called a matrix. Video tape recorders have now been replaced by hard disk recorders which allow a great deal more flexibility including much more memory, allow archiving of recordings from built-in hard disk recorders, can be viewed at the same time as previously recorded images are viewed and can transmit pictures away from the site to a remote site using the Internet. There are many manufacturers including Sanyo, Panasonic, Pelco and Dedicated Micros (DM) to name a few. The monitor is used to view images from the cameras and may be Black & White or Colour and be a number of sizes depending on space, position from the viewer and the number of cameras required to be viewed on the monitor. The two technologies used are LCD and cathode ray tube. The LCD type is popular because it takes much less space but the Cathode Ray Tube provides a better reproduction of the image. Manufacturers:- Panasonic, Sanyo, Vista, Vantage. 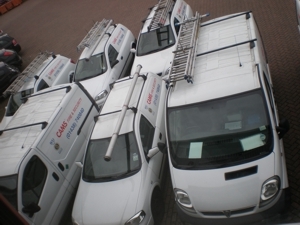 CCTV can be interfaced with other systems such as Access Control and Intruder alarm systems. For example, if a door reader is activated the camera viewing that door can be emphasized to display the door and person/s at the door. Likewise, where the intruder alarm has been activated the camera viewing that detector can be displayed on a monitor. The CCTV can be interfaced with Graphical Interfaces for larger systems with full-time security manning. Displays of the premises can be shown on a monitor and when there is activity from a device, the display will graphically drill down to the specific area and device generating the alert.